Allergies are anything but the bee’s knees. Luckily, I have never suffered from any severe symptoms, but my husband does. Cats make his eyes turn the color of ripe tomatoes and his throat gets scratchy — almost instantly. I feel for him, and others that face similar symptoms. If you can relate to the troublesome effects of pet allergies, know that you’re not doomed. Before we dive into some of the potential remedies for pet allergies, I just want to focus on an interesting 2017 study. First published in the journal Microbiome, this study found that babies who came from families with pets (70 percent of which were dogs), showed higher levels of two key microbes. In fact, when there was a pet in the house, the abundance of these two microbes increased twofold. These microbes are specifically associated with lower risks of obesity and allergic disease, including asthma. It is believed that there is a critical window of time during development when gut immunity develops. The theory is that exposure to bacteria and dirt in early life (such as the microbes found on a dog’s paws and in its fur) support greater immune function throughout one’s life. In a 2016 review, it was stated that pet allergies have been recognized for at least a hundred years. During that time, epidemiologists, immunologists and allergists have dedicated their research to better understanding the link between pet allergens and human immune responses. As discussed above, a fairly new development is that problematic symptoms may not only be caused by allergen exposures but also changes in microbial environments. There are also many other variables associated with rising rates of asthma, including an increase in antibiotic use and a reduction in physical activity. When defining an allergy, this term simply means that there is a presence of immunoglobulin class E (IgE) antibodies. Researchers have since identified other immune responses in relation to such allergens. Overall, it is believed that pet allergens are found in saliva, urine, and dander. Pets are a wonderful addition to the home. However, if you suffer from allergies, you know that the cons can quickly outweigh the pros. Luckily, if you or a loved one struggle with pet allergies, you can intervene! The truth is, pet allergens are everywhere — school, work and even the mall. Although you cannot live inside a bubble, you can make your own home a safe haven. Depending on the severity of your allergies, you may want to speak with your holistic doctor. When you invest in a high-quality air purifier, you can extract tiny pet dander particles from the air. In addition, you will remove pollen, dust, mold spores, and other tiny particles. After all, the greater control you have over your environment, the better. And although you may not experience significant improvements for four to six weeks, this step can combat many other airborne allergens in the meantime. This can be a rather complicated remedy, as you will want to invest in oils that first support your adrenals. In turn, this may help you develop a healthier histamine response. You can also target overall inflammation, in addition to a healthier respiratory system. Always use therapeutic grades and if you have any questions, seek the advice of a holistic veterinarian with a background in essential oils. Once again, this remedy offers antihistamine effects. Increasing the production of T-cells, this remedy can also address allergic reactions to pollen. Histamines are essentially an immune response, which are produced by mast cells. Since quercetin is believed to stabilize these cells, it is recommended that you eat more apples, peppers, tomatoes, dark leafy greens, berries and citrus fruits. You have likely heard of the benefits associated with probiotics in relation to gut health, but they have also been shown to better treat allergies. 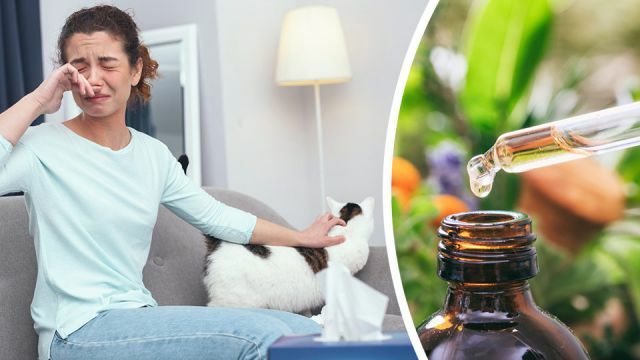 Although this remedy has been shown to be particularly useful for hay fever symptoms, an increased intake of probiotics will benefit a wide variety of immune responses. If pet dander gets into your nasal passageway, you can perform a quick and easy rinse. Flush allergens using an all-natural saline solution and warm water. If you do have a pet in the home, not only should you maintain at least one pet-free room but also actively reduce shedding and dander. To do this, feed your cat or dog quality food — as this will promote healthier skin and a healthier coat. Also, bathe your pet regularly. One study found that after washing dogs with an allergen-reducing shampoo, allergen levels were reduced by 85 percent. Being someone who has grown up around all kinds of animals, ranging from hamsters to horses, I know how valuable they can be to put your physical and mental health. If you currently have a pet or would like to get one, speak with a holistic allergy specialist to see what your options are based on the severity of your symptoms. In some cases, the risk may be too significant. Hey Buddy!, I found this information for you: "Suffering From Pet Allergies? Find Relief With These 7 Remedies". Here is the website link: https://www.thealternativedaily.com/7-natural-remedies-for-pet-allergies. Thank you.